Tell the mozzies & midges to buzz off with this Electric Insect Killer! 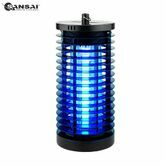 With this handy bug zapper you can conveniently & effectively control flies, midges, mosquitoes, bees and other pesky bugs both indoors and out. It's sleek modern design blends in nicely with any decor and makes an ideal upgrade for any patio, porch or garden. With this insect killer, you can be free and clear of chemicals and of high voltage zapping. That's right: this trap doesn't involve spraying or risky voltage. Instead this insect trap uses fluorescent bulbs with a lifespan of 8000 hours, for maximum insect attraction. Catch them once and catch them for good. With a coverage area of up to 600 square feet and a waterproof design, this insect zapper is ideal for outdoor gardens & patios. And don't forget to grab it when you caravan or holiday! Keep yourself and your friends itch and infection-free with this Electric Insect Killer! *Please note: The lamps in this appliance can not be replaced. Suitable for Cottages, Gardens, Veranda's, Etc.